Our popular (Re)Covered series, wherein we recover songs that dropped through the cracks too late to make it into the posts where they belonged, generally provides an opportunity to check in on previously featured artists, songs and themes. Today, I’ve also included an omnibus reminder to enter our Contest Week contests before entries close on Monday at midnight. But first, thanks to other blogs, artists and label notices, fan submissions, and other agents of serendipitous universe, here’s the scoop on some new songs, new takes, and new discoveries. We made a case for Beck-as-folksinger way back in the early weeks of Cover Lay Down; as I suggested at the time, the stripped-down, almost funereal acoustic side of the popular genre-pushing artist is closer to his heart and history than most popular music fans realize. 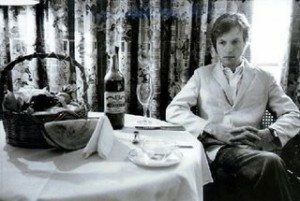 Since then, Beck has continued to ride the line between hiccuping electronic pop and the more pensive works which have wormed their way into the heart of grungefolk audiophiles everywhere, though it’s hard to justify his most recent compilation appearance, a beat-heavy, fuzzed out rock cover of Dylan’s Leopard-Skin Pill-Box Hat which appeared on recent indierock compilation War Child: Heroes, as anything but the radio-oriented track it is intended to be. 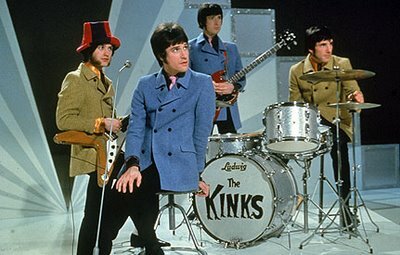 We closed out last summer with a feature on The Kinks, and the subject proved popular: In the days that followed, I received plenty of encouragement, and a handful of tracks from readers. Most were on the syrupy side — I’m not sure why Ray Davies’ songwriting lends itself so well to torch songs. But a few were keepers. Here’s a trio of vastly different but equally summery Kinks covers which have come to my ears since then, and stuck: a delicate solo uke version of Victoria from Ema and the Ghosts, a lighthearted retro-rocker from Holly Golightly, and an older typically british folkrock take on Days from Kirsty MacColl. We featured Sam Jacobs, who fronts the loose collaboration of friends now performing under the moniker The Flying Change, way back in our very first New Artists, Old Songs post, and a few Wilco covers when ex-Wilco member Jay Bennett passed a few months ago. Now, thanks to Sam himself, we bring this exclusive, endearingly lo-fi take on Wilco’s Pieholden Suite, recorded live with full band, including oboe and sax. It’s not exactly folk, but it starts off that way, and stays pretty mellow throughout. Great stuff from a maturing artist. I’ve also included Jacobs’ wonderfully Cohen-esque cover of Tom Petty’s Yer So Bad, recorded under the name Lipstik, which we first posted back in April of 2008, and a great ragged Daniel Johnston bonus cover from Bennett’s last album, which is available for free download here. Finally, our very first annual Cover Lay Down contest week has been quite the adventure. But since geography, availability, and other factors seem to be keeping most folks from entering our two festival-related contests, to make it easier, I’m making each prize for those contests available separately. In other words: EACH contest includes at least one highly-recommended CD, and each CD can be won without stress or commitment. Here’s the list, with linkbacks good until midnight Monday; click on each for contest entry details. If you’re only in it for the CDs, make sure to include the phrase “CD ONLY” in your entry. Cover Lay Down posts new coverfolk features each Wednesday, Sunday, and the occasional otherday. Coming up later this week: Cover Lay Down hits the Hype Machine top 100 pop charts, and we use the occasion to ponder the definitive nature of popular folk songs.